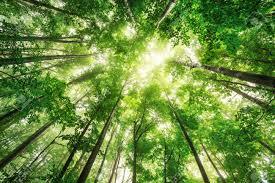 Trees are living organisms that have developed over millions of years. Throughout the time trees have been on earth, they have developed incredible systems and processes which allow them to perform tasks you would never think a tree would be capable of. But it doesn’t stop there. Just the presence of trees alter human buying habits, health, and behaviors. An issue of Nautilus learning-to-speak-shrub, a popular science magazine, explored the idea that plants, including trees could communicate with each other. They discovered that plants and trees can “talk” to each other through chemical codes. Nautilus goes on to say that it is possible for the plants to summon predators to feed on insect invaders. Researchers are intent of discovering more about the communication as it will help understand how plants react to changes in their environment and climate change. The chemical codes plants speak in are carbon-containing molecules called volatile organic compounds. Some of these compounds produce the noted scent of plants while other compounds are only emitted in a response to threats or damage. While all the workings of the codes are not yet understood, the more researchers figure out, the further we move into deciphering the whole ecosystem. Most people may not list trees as one of their items on their wish list when shopping for homes. 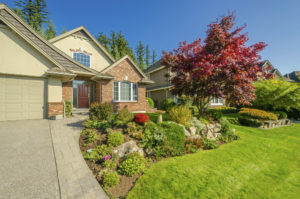 But numerous studies of real estate and trees show that well landscaped yards with mature trees and bushes not only fetch higher prices but they sell quicker than houses without trees and shrubs. On average landscaping, especially with mature trees, can increase property values as much as 20%. Even more importantly, Clemson Universe study found that homeowners get a 100% or more return on their landscape investments. Many may think that trees and bushes are places where criminals hide waiting for innocent victims, but urban city studies actually show the opposite. Among minor crimes, there is less graffiti, vandalism, and littering in outdoor spaces with natural landscapes than in comparable plant-less spaces. Public housing buildings with greater amounts of vegetation have 52% fewer total crimes, 48% fewer property crimes, and 56% fewer volient crimes, including 25% fewer acts of domestic aggression and violence. It might be difficult to believe that trees have more of an effect on society than providing oxygen and shade but it may be true. According to studies as far back as the 1980’s viewing trees and interacting in nature boosts health and happiness. A 1984 study showed patients recovering from surgery in a room with a view of trees recovered quicker and required less pain medication than those without the view. Recent studies have even suggested a connection between trees and lower obesity, general health, immunity, morbidity, and mortality. So next time you’re feeling stressed or under the weather take a walk outside or relax in the shade of a tree; it could be just what the doctor ordered. 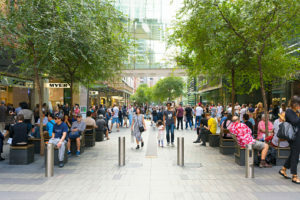 Many newer retail developments are starting to incorporate trees, shrubs, and green spaces to their shopping districts. 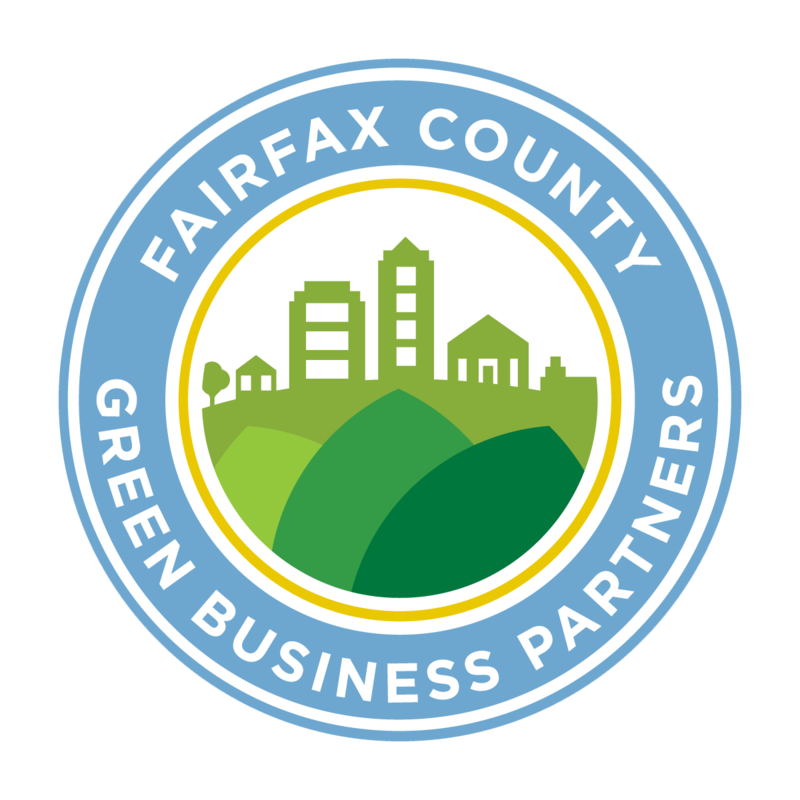 As consumers, we enjoy these green areas but most of us don’t realize the addition of trees and shrubs are calculated choices that increase the developer’s return on investment. 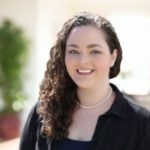 Research by the National Arbor Day Foundation shows that commercial retail areas that have trees and green spaces are more attractive to consumers. Shoppers are even willing to spend 9%-12% more on average, travel a greater distance, and spend more time once they arrive in retail districts that have healthy trees and shrubs. When humans get sick an easy indicator that we are fighting an infection is the increase in our body temperature, or what we call a fever. Like humans, recent thermal imaging studies show that trees run fevers as well. In the case of trees, stress caused by an invasion of insects or onset of a disease leads to stomatal closure which then results in the increase of leaf and canopy temperatures. The most important part of trees running fevers is that it can help with early detection. Researchers studying tree fevers suggest that we may be able to use thermal imaging in the future to diagnose trees with illnesses before they start showing symptoms, leading to higher survival rates and improved overall health. Trees sustain injuries just like humans, however, trees don’t heal the same way we do. Instead of healing they focus on sealing; they do this in two ways. 1) External wounds seal over time by being surrounding with new growth until they are protected from outside infections. 2) The tree cuts its losses. In the second way of sealing trees abandon’s the branch or injured area. Trees do this by sending special cells to form an internal wall blocking the injured branch from transferring its infection. To do this the tree cuts off the injured branch’s nutrient supply, in a sense amputating the injured limb. Although, this is the tree’s natural way of responding to injuries it is not fail safe. It is typically better to help your tree out by consulting a Certified Arborist when your tree is sick or an injury occurs. Similar to how we have natural immune systems but we still need a doctors help and medicine from time to time. Next Have You Made These 7 Construction Tree Preservation Mistakes?